Interactive tool delivers immediate peer-to-peer comparison as well as personalized report card on communications practices. The ability to provide our customers with a tangible means of comparing individual performance to that of their peers is a great advance over previous studies. Dynamic Benchmarking, a provider of customized online benchmarking and reporting solutions, has added a new facet of functionality to the business communications best practices survey it created for Naylor Association Solutions. The Association Communications Benchmarking Study now adds personalized scorecards that compare an association’s communication activities to industry-established best practices as an additional means of identifying areas of excellence and deficit for its participants. A provider of content strategy, print, digital, video, career, learning, association management software (AMS) and event management solutions to the association market, Naylor moved its communications benchmarking study to the Dynamic Benchmarking platform last year. The ease of use and ability to generate customized, peer-to-peer comparisons was well received by the company’s customer base. Seeing the potential to make a substantial impact on the association industry’s communications practices, the Naylor team decided to add a new level of functionality to their benchmarking tool. To achieve this, Dynamic Benchmarking introduced the Naylor team to their scoring solution which allows users to enter key performance metrics and receive ‘scores‘ or ‘grades’ based on how their efforts measure up against predefined industry standards. Using the vast collection of industry data and the combined industry expertise of the Naylor staff, Dynamic Benchmarking helped form quantifiable best practices standards for various communications programs, strategies and tactics. Now, as users enter their data, they not only have access to more than 250 different dynamically generated, personalized reports, charts and graphs, but they are also presented with a personal scorecard that will grade their performance against these defined industry standards. “We are excited for our survey participants to not only see how they compare to their peers through the benchmarking platform, but to also give them a chance to see how they perform against industry best practices through the new scoring platform,” Bornmann adds. “Now participants can see their own score, the median score and the best practices score all at once. They can readily see areas for improvement and determine the extent to which they are lagging behind their peers and the industry as a whole. Armed with this performance information, associations can initiate conversations within their organizations to begin enhancing their overall communications effectiveness. Naylor Association Solutions provides products and services that drive member engagement and revenue for 1,800+ associations in North America. Founded in 1969, Naylor helps trade and professional associations drive member engagement and revenue by offering an array of solutions, including communications strategy, content, print, digital, video, full-service event management, advertising, sponsorships and exhibit sales, career centers, online learning, association management and association management software (AMS) solutions. It’s not what Naylor does that makes us unique; it’s how we do it. Our team is committed to customer service, has a strong sense of integrity and possesses deep expertise helping associations achieve more success. Naylor’s headquarters is located in Gainesville, Fla., with additional offices in McLean, Va.; Alpharetta, Ga.; Darien, Conn.; Schaumburg, Ill.; and Winnipeg, Canada. For more information about Naylor, go to http://www.naylor.com or follow us on Twitter at http://www.twitter.com/NaylorLLC and Facebook at http://www.facebook.com/naylorllc. Dynamic Benchmarking is a New Hampshire-based startup that delivers real-time benchmarking and data analysis solutions with the features and capabilities of custom software in a format that is easy to use and quick to deploy. 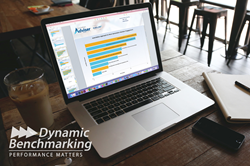 Founded by a team of women entrepreneurs, Dynamic Benchmarking combines powerful, web-based technology with unparalleled industry expertise and customer care to provide best-in-class, peer-to-peer data comparison for small businesses, associations, large enterprises and any organization looking to tap into the knowledge of the crowd. Dynamic Benchmarking builds web-based solutions that are flexible, scalable and allow for meaningful comparison of financial and operational performance in a dynamic and interactive manner. For more information, please visit http://www.dynamicbenchmarking.com.